In the past decade, Software-Defined Networking (SDN) had dashed from being a set of nascent academic ideas (SANE, Ethane, and 4D) to being a significant and growing part of the networking industry complete with multi-billion dollar acquisitions and mature shipping products. Although not an obvious requirement, in practice this has been largely achieved through open source software providing an opportunity for the broader community—including academics—to participate and shape the future of networking in a direct way. The same software being used in production deployments is actively and openly developed from softswitches (Open vSwitch, LINC, Snabb) to controllers (OpenDaylight, Floodlight, Ryu, ONOS), to hardware and firmware (Facebook’s Wedge/FBOSS, SAI, Open Network Linux, Broadcom’s OF-DPA). 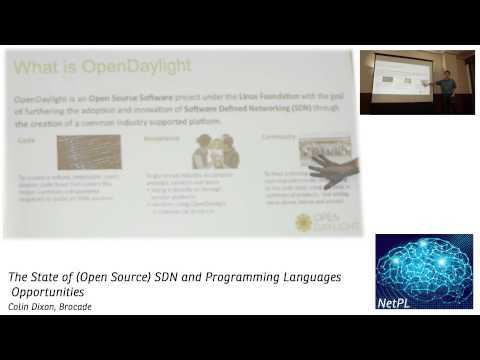 In this talk I’ll focus on the state of these projects and some thoughts on areas where the academic research (and in particular) programming languages could provide significant advancements in the the state of practice including: managing trade-offs in distribution vs. centralization, providing cross-hardware-platform portability, application composition, and migration from traditional networks to SDN. Colin Dixon is the Chair of OpenDaylight‘s Technical Steering Committee and a Principal Engineer at Brocade. In both roles, he focuses on leveraging open source software to build innovative networking solutions. He is also a researcher specializing in distributed systems, networking, operating systems and security. Previously, he was a researcher at IBM Research’s Austin Lab. He received his PhD in Computer Science from the University of Washington in 2011 working under Tom Anderson and Arvind Krishamurthy. His dissertation “The Network as a Platform” looked at how to use software to build networked systems that would now be called Network Function Virtualization (End to the Middle) and the Internet of Things (HomeOS).